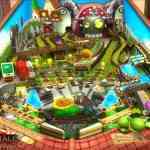 Pinball FX 2 brings us a great new table inspired from another well-known arcade title, Plants vs. Zombies. 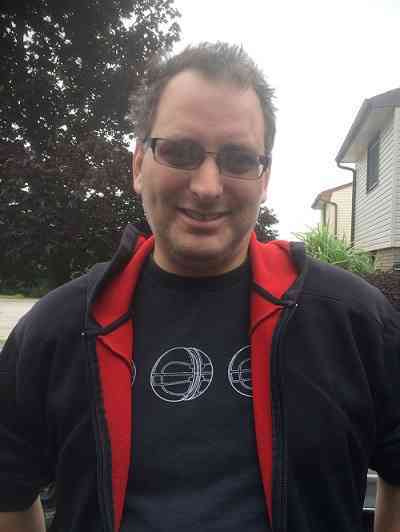 For those interested in getting a new Pinball FX 2 table, you are more than likely a fan of the game. 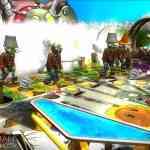 I know that I am a fan and I have played every table released for this Pinball FX 2. 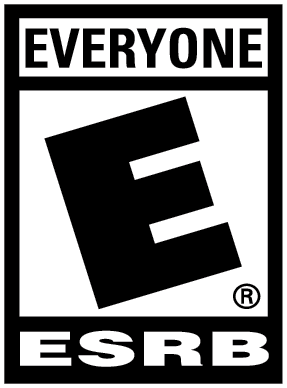 If this describes you then you have most likely become quite accustomed to the design elements and gameplay features whenever a table is released for this game, and it is easy to jump in and get lost in a new table on a quest for that ultimate high score, and this is exactly what the Plants vs. Zombies table offers. New players to the Pinball FX 2 fear not though, as gameplay is as simple as keeping the pinball from falling off the table by using the left and right flippers to propel the ball back up while acquiring as many points as possible. Points are collected in a variety of ways like hitting bumpers, hitting specific targets or completing built in mini-games on the table. 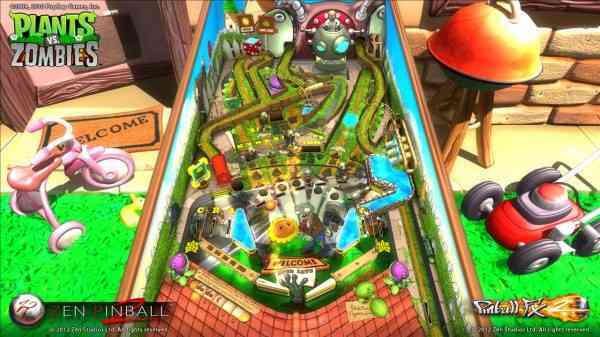 Usually each table tells a story and the games and features of the table are themed within that story to create the pinball environment. 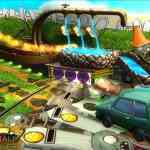 Pinball FX 2 itself is free to download with all of the tables available as individual tables or specific table-pack purchases. 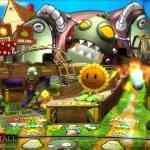 In the original Plants vs. Zombies, plants battle waves of oncoming Zombies to prevent them from overtaking your home. If you have ever played a game than you’re in for a real treat as the developers of this table have modeled it perfectly with almost every element of the game having been incorporated. Characters like Dr. Zomboss & Zombot, Crazy Dave and of course a variety of Zombies including the Conehead and Buckethead varieties make an appearance along with some plants like Sunflowers, Pea-Shooters, Chompers and a Melon-Pult. Not only do you have these plants active on the table, there are also Chile Peppers, Cherry Bombs, and Wall-nut seeds that you can use to the combat the Zombie waves in addition to other items you can purchase through a table mini-game. Yes, Zombie waves do happen on this table, which when you think about it is really cool. 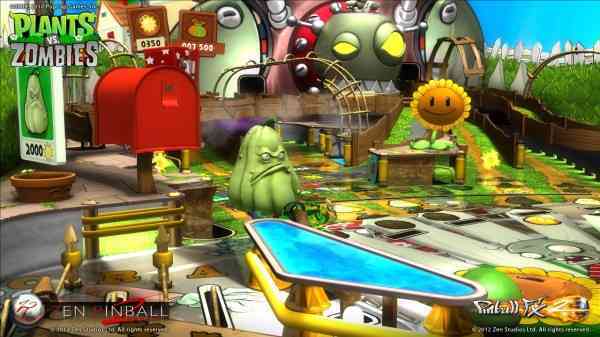 When the Zombies pop up you have to use your pinball, which happens to be a pea from a peashooter, to take out the Zombies. The number of zombies you need to take out will increase as you progress through the challenge stages, as well as the difficulty of the zombies. There is also a time limit for these challenges. Sometimes stray zombies just randomly pop up one at a time so you can get some extra points and in other cases you get to use your melon-pult to aim and hit zombies for even more points. When you destroy the zombies coins will pop up that you can collect to purchase seeds to combat the zombies. To access the ‘store’ you will need to knock out Crazy Dave’s taillights and land in his trunk after he drives onto the scene. 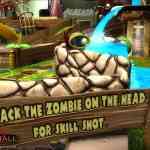 In addition to the challenge stages there are also bigger mini games such as Welcoming Committee or Zombies Love Football where you must complete certain challenges to become victorious. Visually this latest table takes everything right from the Plants vs. Zombies game, with the roof of the home being on the bottom of the screen and a pea-shooter and the melon-pult right on the top. Off to either side of the home there are Chompers that act as your kickbacks, which may seem pretty simple but I thought this was a pretty ingenious way to use something different to perform that task. You can also get ball saves from your trusty lawnmowers launching them back into the table (mind you, you never actually see a mower just the familiar sound of one going). The table was complete with a variety of sound effects including zombies eerily saying ‘brains’, chimes, jack in the box music, and the pings of your peel as it bounces off of a zombies tin pail helmet. There was also some upbeat and surprisingly enjoyable voice work from the female narrator warning you of upcoming zombie attacks as well as your successes and failures on the table. 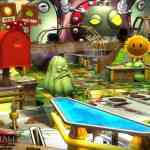 Pinball FX 2 Plants vs. Zombies is a great table because you don’t have to know anything about the original game to understand the pinball table and the challenges it provided. There is no deep complex story line just some good old pea flinging action. If you see a Zombie destroy it, it’s just that simple. 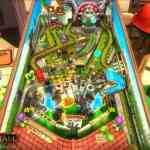 The table features all of the amazing graphics, gameplay and sound as other tables and makes a fantastic addition to your Pinball FX 2 table collection.